On this day in 1953, newsstands unveiled the first issue of TV Guide. Before on-screen programming guides and the Internet, the Guide was the bible of tube lovers everywhere. Today collectors still love to find old issues, and we at BOTNS like to use 1970s and 1980s editions for our TV Guide game! 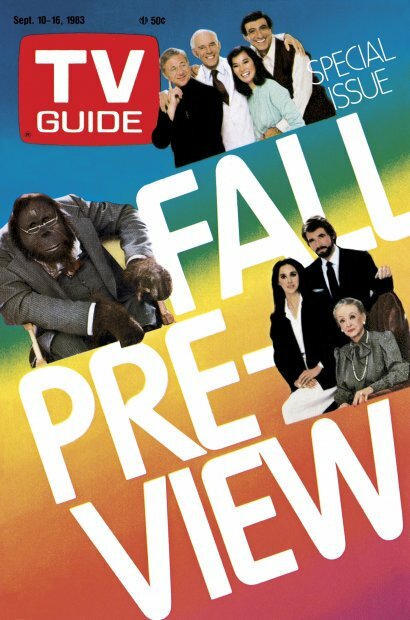 Here is one of the great Fall Preview issues from the BOTNS era, the 1983 issue. New shows highlighted on the cover: AfterMASH! Hotel! And you know that in 1983 it was NBC that brought us the show about a talking orangutan: Mr. Smith!